Sunday night’s WWE WrestleMania 2018 results featured the big return of Daniel Bryan to the squared circle. Bryan had been forced to retire from in-ring action about two years ago due to being shut down medically after an injury he suffered. At that point, it appeared his career in the wrestling ring was officially over after years of entertaining the fans with his dynamic moves and in-ring skills. 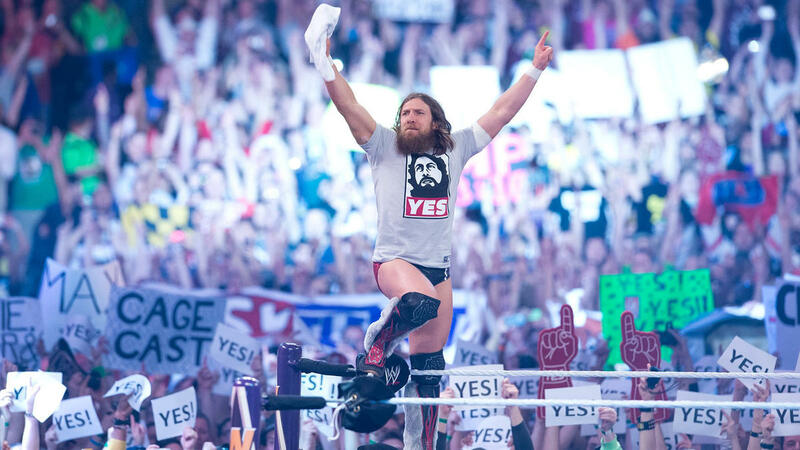 However, WrestleMania 34 provided the moment fans had hoped for as Daniel Bryan was officially back to lead the “Yes Movement” again. It was a long time coming and well worth it. With nearly 80,000 fans in attendance at the New Orleans’ Mercedes-Benz Superdome and millions more watching from around the world, Daniel Bryan stepped back into the wrestling ring. As Wrestlezone reported, the big match took place towards the end of the third hour of the WrestleMania 34 pay-per-view card with Bryan teaming up with SmackDown Live Commissioner Shane McMahon. They would look to get some revenge against the heel duo of Sami Zayn and Kevin Owens who had staged separate attacks on them on episodes of the blue brand show. Zayn and Owens who strike again ahead of tonight’s match as they rushed into the ring to attack Bryan and Shane from behind. The two heels gained the advantage by doing so and knocked out Bryan outside the ring. That would require medical personnel to come in as it appeared the SmackDown GM was done for the night. Meanwhile, Shane opted to get in the ring and take on Owens and Zayn by himself. Shane was able to withstand the two of them for a little bit, but eventually, the numbers game caught up with him. Owens and Zayn gained control with Bryan still out of action. At one point they had what appeared to be the winning pinfall, but out of nowhere, Daniel Bryan managed to rush back in to break it up. Bryan would end up on the apron and tried to cheer on Shane to get away from the heels. Shane ultimately used the bottom rope to pull himself towards the corner and extended his hand for the big tag. That brought the crowd to life as they went crazy with Bryan’s entry into the ring after years away from the action. Bryan would deliver with move after move including his trademark “Yes” kicks as the crowd chanted with them. Ultimately, with Kevin Owens out of the ring, Bryan was able to deliver a huge kick to Zayn’s head and collected the winning pinfall. Following the win, Bryan and Shane celebrated in the ring. Daniel Bryan would leave the ring and head over towards the crowd to get a kiss and some words of praise from his wife Brie Bella. From there, Shane and Bryan headed over to another part of the crowd to slap hands with Shane’s kids and family, before they headed up the ramp. With the victory, Kevin Owens and Sami Zayn are now officially fired from WWE’s SmackDown Live. More importantly, Daniel Bryan and the “Yes Movement” have returned triumphantly after it seemed they would never be back for in-ring action. Bryan’s return was certainly a WrestleMania moment to be savored.